Join us for the NH State Home Show March 8th-10th! The snow is melting and Spring is around the corner! If Spring makes you think about all things HOME, both Interior and Exterior, then the NH Home Builders Association has the event for you! This weekend, visit the NH State Home Show at the newly renovated Doubletree by Hilton in Manchester, NH, where you will see the newest and most innovative products and services in the home industry! Visit the 2018 NH Designer Show House! Wow! It’s August and Summer is winding down. Before you begin reflecting on all the Summer activities that you enjoyed, include one more! 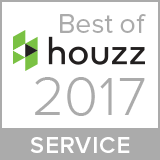 For anyone that enjoys visiting area Historic architecture, enjoys high-style Interior Design, or is interested in helping a worthy charitable cause, YOU can accomplish all 3 by visiting the 2018 Nashua Designer Show House! See this classic turn-of-the-century home built in the historic Beaux Arts architecture right in Nashua NH. The Frank E. Anderson House is listed on the National Register of Historic Places as part of the “Nashville Historic District”. See what incredibly talented Interior Designers and other professional craftsmen have done to preserve and re-design this beautiful landmark! Over 18 Interior Designers and the trade professionals that they work with, donated their time, talent and treasure to creating amazing spaces that will inspire and delight the visitors. You may even have the opportunity to meet some of these designers and discuss your next design project! 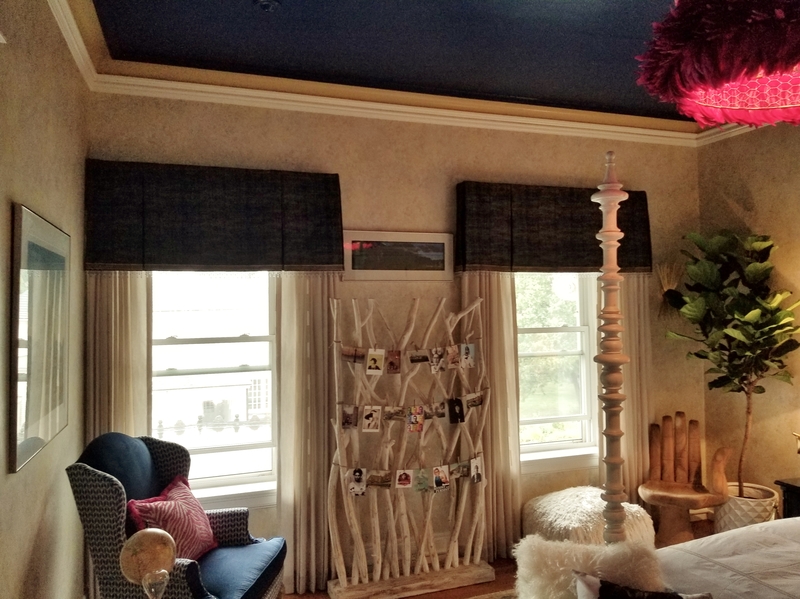 I had the pleasure of visiting this historic mansion back in January for the 1st time, when Dianna of Dianna Normanton Interiors, invited me to consult on textiles and design the window treatments for her 2nd Floor Bedroom. Dianna created a whimsical and vibrant bedroom for a mid-20’s young professional woman. Her design for this room, while very fun, also respects the historic nature of the home and the fact that it will be occupied after the end of the Show House. Check out Dianna’s facebook page to see the progression of the room! It must be Spring! 2018 Sunbrella® has arrived! 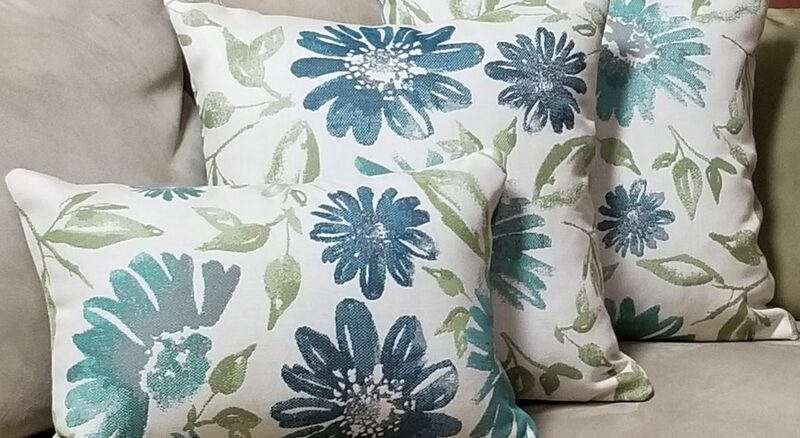 These beautiful pillows are made from one of the latest collections of Sunbrella® outdoor fabrics! They will be headed outdoors soon, just like the rest of the New Englanders that are ready for Spring. Did you Visit the 2018 NH Home Show? Thank you for visiting this year’s Home Show and for stopping by our exhibits! Join us at the 2018 NH State Home Show! Join us and over 300 vendors at this year’s NH State Home Show! My favorite chair needs help! Should I have it re-upholstered? This tiny antique footstool was used by several generations and falling to pieces. We shored the base for stability and added fun leopard print chenille fabric and nailheads so that it now coordinates with other furnishings in the room! You have a beloved chair that has been like part of the family. You look at it one day and realize that it cannot stay here in its present state! Maybe the fabric is extremely worn from being everyone’s fave, or faded from the sun, and has become an eye sore. Or maybe you have changed the design style in this room and the fabric on the chair no longer works. 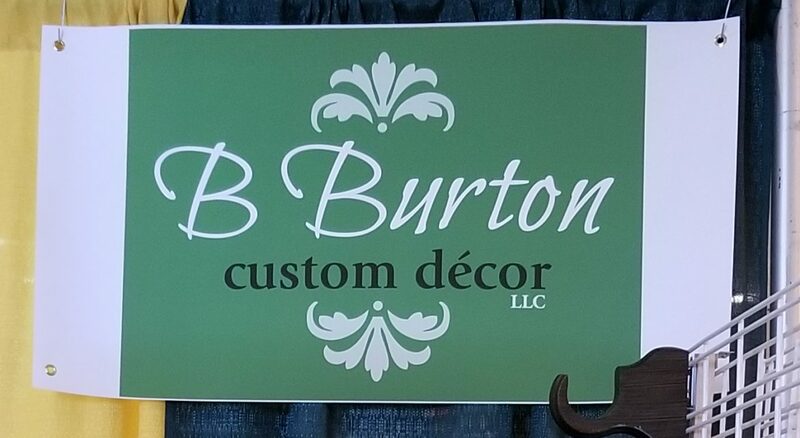 Happy Holidays from B. Burton Custom Decor! We just wanted to wish you happy holidays and a happy new year, too! We can’t wait to help you with all of your custom organization, design, accessories, blinds, shades, and otherwise needs in 2018! Remember, if you need any help now before the holidays, contact us and see what we can do to help! My home has small closets, where do I store everything? I need shades! Which are safe for the children in my home? October is National Window Coverings Safety Month, dedicated to educating consumers on which are the safest products and operating options as well as raise awareness on the risks of corded products. Lafayette Interior Fashions Allure© shade with a child safe continuous cord loop. Seven years ago, this may not have been a concern for any family moving into a new home, or a couple that entertains their grandchildren or other young children in their home. How could shades, blinds or other window coverings be a safety concern? Don’t they simply block sun or provide privacy?